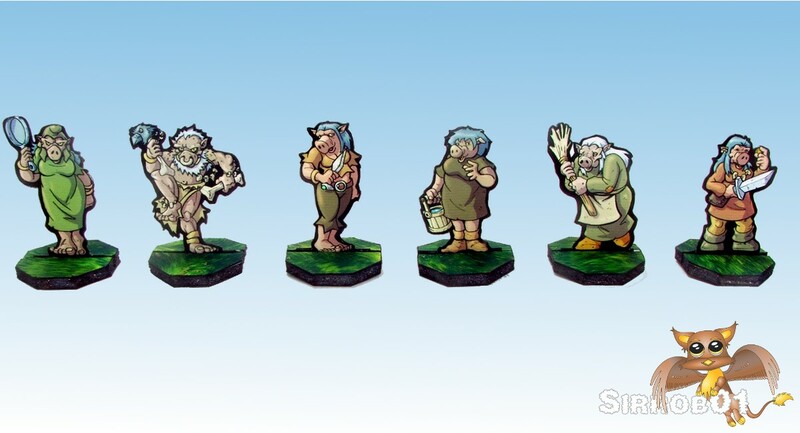 This is the second set in Darkfast series that Okumarts has released. As the numbering for the Darkfasts series starts at zero this set is labeled as Set One: Orc Tribe. I wont repeat the scaling and background information in this post but you can read all about it in the top of this post. 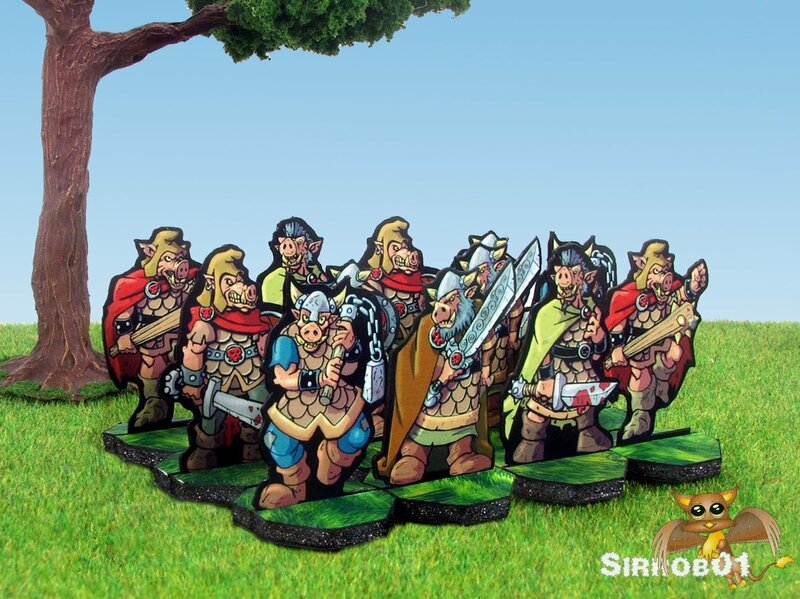 Including Orc’s with Axes facing left and right, great as gate guards, the same yet different. The female Orc thief could make for a very nice NPC or even an unusual PC character. The ability to have four colours of the main warriors, you could have four different clans all fighting, with the PC’s trapped in the middle. Okumarts has kept the outlines fairly simple although if you are cutting by hand there are a few hair, cloak and horn points you’ll need to cut around. 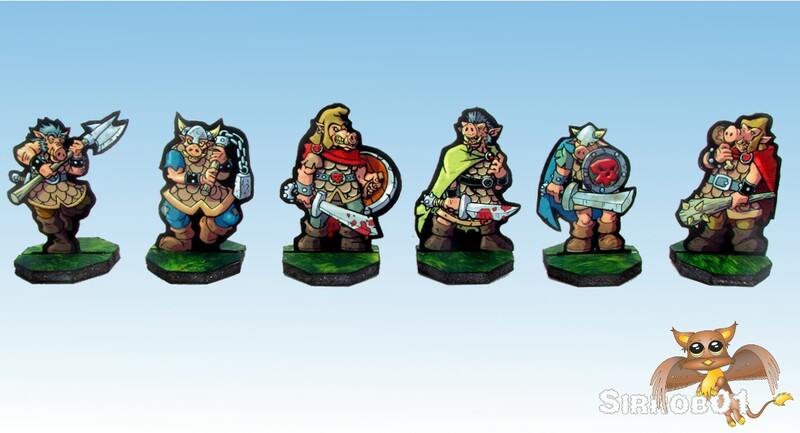 The back to front alignment on the set is excellent which can be an issue with front/back paper miniatures. I was a little skeptical of the cloak colours when viewing the PDF on screen, particularly the green, however on print out all four colours look good. 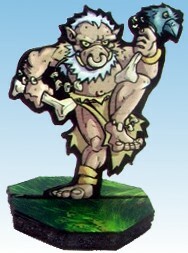 The miniatures themselves are bright and have excellent colour toning. Identification of the different miniatures on the tabletop was very easy when looking down at them from a seated position at a table. The PDF’s are not “locked” so editing them for my (or your) own personal use is easy rather than if they had been password protected. I have no real issues with the set except wishing that the little craftrobo “L’s” (alignment marks) were on the pages. The only other small comment I have is that I would have liked to see a few female warrior types mixed in with males. However this is an area that metal/plastic miniature manufacturers tend to miss so no big issue. Although in the case of Orcs I can understand their military might not be an equal opportunity employer, unlike more open minded races such as Wood Elves. This set would be great for any GM who’s players are about to invade an Orc stronghold or try and wipe out an Orc village. 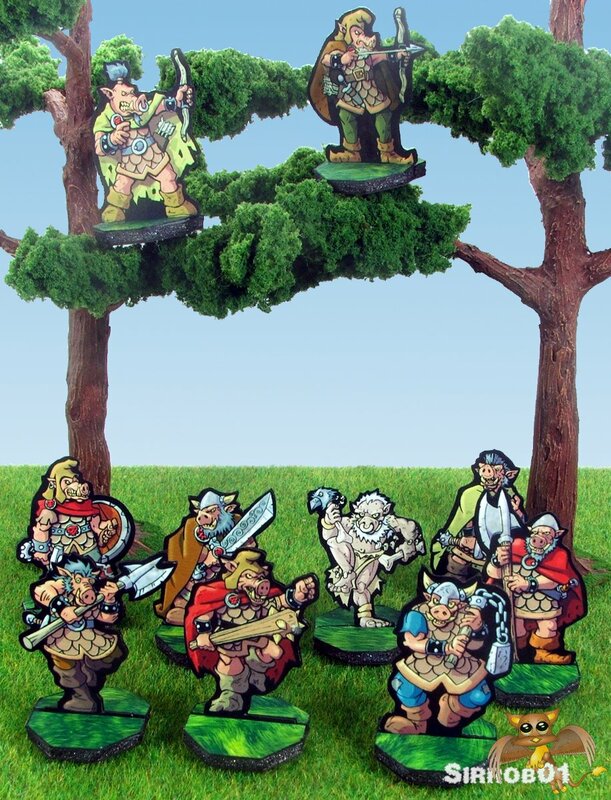 Print each of the warriors out in two or three different colours and the villagers once and you could set a really nice scene on the tabletop. This set will also make for a nice warband for a skirmish sized wargame (8-10 miniatures per person) such as Song of Blades and Hero’s. 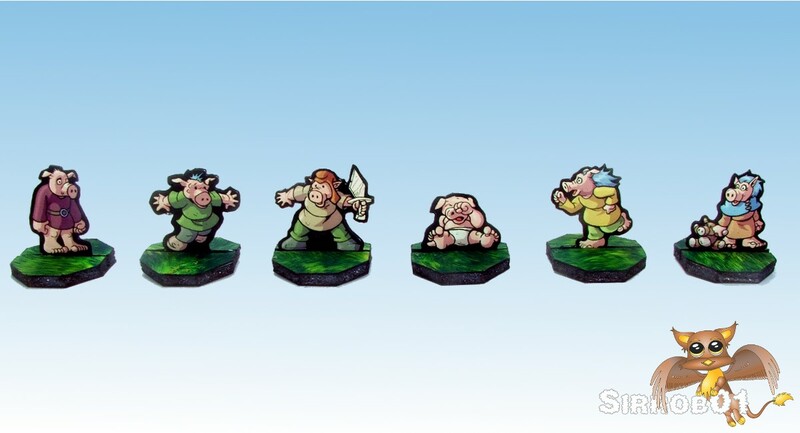 At this point in the Darkfast series this set can’t quiet provide enough variety of miniatures on it’s own to start to outfit a full fantasy Pig Orc army using rules such as No Quarter. Saying that you can field three different types of foot units, Hand to Hand, Archers and Polearms although you might see a little repetition in the units, to this you could add a Ballista (link) or Catapult (link or link), use the Old Shaman as a powerful magic user and use the Orc from Set Zero as a Hero, this will leave you short on some form of cavalry and a command type group. Okumarts is a big fantasy fan so I have no doubt that we will see some more Orcs in the future. This set is a pay set but will only set you back $2.50 USD about 10 cents a model if you don’t count colour options, less if you do. 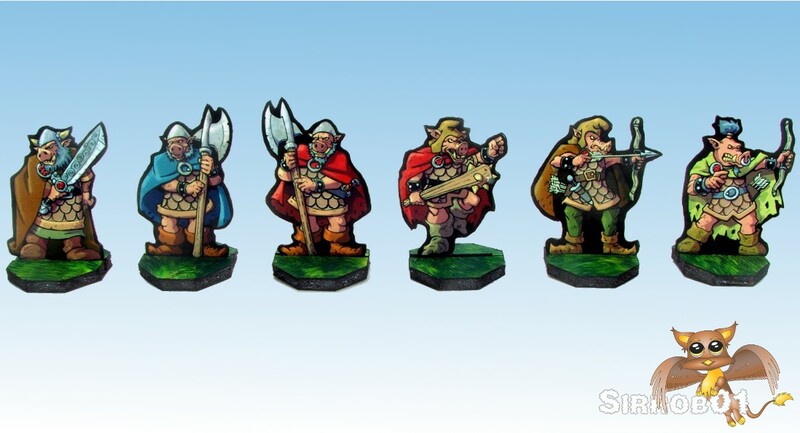 The set is excellent value for money and the artwork is of a very high standard. I’d recommend picking up a set for yourself, if you have any RPG GM’ing in your future or need a few warbands for a skirmish level wargame. However if your only use for this set is more along the lines of needing a full Fantasy Army I’d carefully weight up buying and building what you can now or simply waiting to see if further miniatures are released in the future and then pickup both sets at that point, so you can better field a more complete army to begin with. For myself it was no brainer buy and I’m really happy with how the miniatures look on the table. I’ll wait with crossed fingers for more variants in the future to help fill out a more complete army list for Fantasy Wargaming or possibly I’ll just mod some for my own personal use.